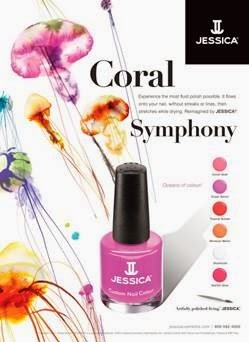 Jessica Nails have a new collection out for spring/summer - 'Coral Symphony'. I think one of the best ways to change your look from winter to spring/summer is to change the colours you wear on your nails and this collection is great to welcome in the new season! This is the kind of collection I really like, lots of bright and vibrant colours. I was kindly sent out of the colours - Tropical Sunset. It's a bright pinky red, almost tomato red, almost coral and verging on neon. It's quite different to a lot of other colours I've seen. I can see myself wearing all the colours, especially Ocean Bloom and Starfish Glow. I used a base coat, two coats of Tropical Sunset and topcoat. This is definitely a two coater, the colour goes on really smoothly and it's very glossy. I decided to add a gradient which a light yellow colour to symbolise the sunset. Having worn it for 3 days now, there have been no chips and the polish is still lovely and shiny. The Coral Symphony range is available for €12.95 from salons nationwide and online at www.frenchbeautyroom.com, amongst others.